Vous souhaitez poser une question à l'établissement Casa Holiday Hotel ? Parfait pour le plaisir et la détente, le Casa Holiday Hotel se trouve dans le quartier de Phitsanulok centre à Phitsanulok. De là, les clients peuvent facilement se déplacer et profiter de tous les avantages offerts par cette ville dynamique. À une jetée de pierre se trouvent Big C Phitsanulok, Wat Aranyik, HomePro Phitsanulok. À travers ses services de qualité et un vaste éventail d'équipements, le Casa Holiday Hotel s'attache à rendre votre séjour aussi agréable que possible. Les service en chambre 24h/24, WiFi gratuit dans toutes les chambres, sécurité 24h/24, ménage quotidien, réception 24h/24 ne sont que quelques-uns des équipements à la disposition de chaque hôte. L'atmosphère du Casa Holiday Hotel se retrouve dans toutes les chambres, et internet sans fil (gratuit), chambres non-fumeurs, climatisation, télévision câble/satellite, douche ne sont que quelques-uns des équipements disponibles à travers l'établissement. Grâce au vaste éventail de loisirs proposé par l'hôtel, les hôtes ne manqueront pas d'activités durant leur séjour. Le Casa Holiday Hotel est le lieu de séjour idéal pour les voyageurs qui recherchent charme, élégance et confort à Phitsanulok. Pour un prix abordable, on a enfin eu un confort correct dans cet hôtel. Un peu en retrait de la rue, il n'est pas trop bruyant. Personnel adorable. Le patron nous a même consacré un quart d'heure et prêté son portable pour régler un problème personnel. hôtel simple mais agréable, en périphérie de la ville (assez loin du centre et de la gare) mais à proximité d'un centre commercial (à 500 m à droite en sortant). chambres et salles de bains bien tenues, personnel aimable. petit salon au rdc donnant sur l'extérieur, où l'on peut admirer une collection un peu "vintage" de la famille royale. taxi sur demande, pas excessif. The hotel was very clean,quiet, close to the big stroe, the bathroom was clean ane dry Everything was good for me, I like this hotel a lot. This is really not a hotel we would recommend to anybody. First of all it's not close to the center at all, but alongside some sort of small highway. Second of all the staff doesn't speak any English. This is especially difficult when you don't have any water coming from the tap/shower in the morning which happened to us. We never managed to explain it to the reception and just left out of frustration. Phitsanulok is in general a town that should, if a stay is not absolutely necessary, be avoided. Sukothai is a much better place to stay. Just don't go there. Clean room, close to highway, descent restaurant on site. Had a hard time finding hotel using Agoda map. Two or three block past where shown on map. Just stayed night passing through so Andy to highway. 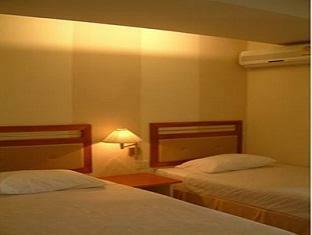 Friendly staff, clean comfortable room. Food was cheap and good. the room is very nice ( on 3rd floor). a bit noisy at the night time because is located on street. good for short stay. wifi is fair. Looked nice from the outside. We had a stopover in Phitsonulak and booked this hotel as it was cheap and looked nice for the price. When we arrived we found out that they hadn't received our booking and were completely full. They did help us find another place down the street and had the security officer drive us there. Everything looked nice from the outside. I would just call ahead to make sure they have your reservation. Value for your money with exceptional return! I was shocked with the price because i got MORE than what i paid for. The service was good, the room was tidy, and the location is great! I will definitely go back here! Normal hotel nothing special but the food was not the best. The staff was very kind and eventhough they didn't speak english they tried to help in everything. Although the rooms are quite small the staffs are very friendly and helpful. This place had a great feel. Short taxi ride from station and bus terminal. Stayed here for 1 night and took bus trip into sukothai. Staff friendly tho English not so great but that was part of its charm. Everything written in Thai but that goes for most of the town. Loved the room and would recommend for sure. Okay if you really need to stay in this town. This hotel is probably the better one in town and not too far away from the bus station. However, the staff could not speak English and was quite unfriendly. Also, they couldn't help us with questions on bus schedules and prices. The security of the hotel is also quite questionable and there's no place for having a breakfast close. All in all, we didn't feel welcome in this hotel. Very friendly staff and well kept facilities! Loved our stay here. We were on our way to sukkothai. The cheapest place we stayed but one of the nicest by far!